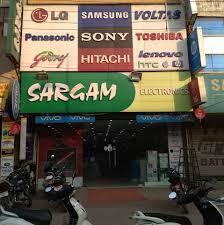 sargam electronics is Indians leading Electronic and Home appliances Store it gives Services in North India.It was Started in 1984.Sargam Electronics Pvt.Ltd.It was Expanded this Services in North India majority Stores nearly 46 in Delhi.with Multi brand Format.it offers the IT and Accessories.this Company deal with National/multinational Companies across industry. the main support for Sargam electronics is Customer trust and confidences in Sargam brand for there Loyalty. to know more Information about Sargam electronics visit Official Website. # 1-3-183/40/57/1, Opp Med plus, Near green bawarchi hotel, Gandhinagar, Hyd-500080.